ZAATARI, Jordan — Omaima Hoshan, 14, wasn’t really aware of early marriage until her best friend dropped out of school in the fifth grade. Omaima was very concerned. Her friend was an excellent student — the best in their class — and had always dreamed about becoming a doctor, so why would she leave school? Omaima learned from the teacher that her friend had married her 18-year-old cousin under pressure from her father. The girl hadn’t even turned 13 yet. Omaima never saw her again. From that day, Omaima noticed more girls leaving school as young as 12, 13 or 14 years old. She remembered thinking it was totally wrong. They were just children, like her. She talked about it with her father, Thaer Hoshan, who had studied law back in Syria. “He told me that I should speak up if something is wrong and encouraged me to talk to the girls about this subject in order to discourage the practice,” Omaima told Al-Monitor in Jordan’s Zaatari refugee camp, where she has lived with her parents and four brothers since they fled Syria in 2012. Encouraged by her parents and inspired by Nobel Peace Prize winner Malala Yousafzai — she read her biography — Omaima, who will turn 15 in March, started campaigning against child marriage. 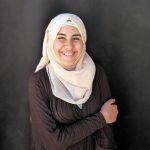 First she spoke to her classmates and encouraged them to talk to their parents about it, and later she organized events such as art classes and drama workshops about the risks of early marriage for girls and their mothers in the camp. To do all this, Omaima works together with a child-protection group in the camp run by Save the Children. Like any other teenager, Omaima sometimes looks shy when she talks about sensitive subjects such as sexuality and boys, but when she speaks about her mission to end child marriage, she looks fierce and determined. “Girls who get married at a really young age are more at risk of sexual or domestic violence as well as miscarriages because their bodies are not really ready for giving birth yet. Also, girls who get married at an early age are not mentally ready to raise children and are less able to complete their education and find a job,” Omaima explained. Although it’s illegal to get married under 18 in Jordan, the practice is increasingly common among Syrian refugees. In 2015, 35% of all Jordan marriages involved a minor, up from 18% in 2012, according to the Jordanian Higher Population Council, citing statistics from the Chief Islamic Justice Department. But religious judges in Jordan may authorize marriages involving children as young as 15, provided they believe the child’s best interests are taken into account. For many Syrians in Jordan’s urban areas and refugee camps, marrying off girls at a young age is a desperate attempt to ease the financial burdens on families that have little or no income and are trapped in a vicious cycle of poverty. Another common reason for child marriage among Syrian refugees is the protection of young girls in places where they are at risk of sexual violence or harassment. However, tradition also plays a big role, as girls in some parts of Syria often marry at a young age, Omaima said. “Most of the people in Zaatari are from the Syrian countryside. They think that marriage is the best option for young girls. Boys usually get married between the ages of 18 and 25 and all of them want a younger girl. In Zaatari, when a girl is not married at the age of 20, they consider you too old. ‘Why isn’t she married?’ people would say, thinking that something is wrong because she is not married yet,” Omaima said, her gaze intense. In the refugee camps, it is not difficult to find girls who married early. A few blocks from Omaima’s house in Zaatari, 17-year-old Nariman, who declined to give her full name, told Al-Monitor how she married her cousin at the age of 15. Now she is seven months pregnant. Her first pregnancy ended with a miscarriage. When asked if she thinks it had anything to do with her body not being ready to give birth yet, she said, “I don’t know,” and added that she likes being married. Nariman’s sister, Busra, 14, said she didn’t want to get married, but when her father asked her to say yes to a boy who spotted her in school, she was afraid to say no. On what would have been her wedding day, Busra took a shower and got dressed when the family received an unexpected call. “A Jordanian employee of the government’s Family Protection Department called my parents. They told my father he would get a fine of 3,000 dinars [$4,231] if he went through with the marriage as I was only 14 years old,” Busra told Al-Monitor, clearly happy someone intervened. The family canceled the wedding. Omaima said it’s easier to talk with the girls and their mothers and grandmothers than with their fathers. When she started this campaign, some told her to mind her own business and were uncomfortable with the idea of such a young girl raising awareness on a sensitive subject. When asked what would happen if she ever feels threatened by anyone, like her role model Malala was, Omaima answered that it is her right to speak up and set ambitious goals, just like men do. “My life is not more important than the life of any other girl. If you can save a ship full of people by sacrificing your own life, what would you choose? I know what I need to do,” she said. Omaima believes she has persuaded several girls in the camp to abandon their plans to marry young and continue their education instead. She hopes to continue her studies and become a famous women’s and children’s rights activist in the future. Like her father, Omaima’s mother, Rana, is very proud of her daughter. “Omaima is only 14 and she already achieved so much. When Omaima grows older, she will be taken more seriously, I believe,” she said.